True Port comes only from the Douro river region of Portugal. Produced from many different varietals, this wine is fortified with brandy resulting in a higher-alcohol (typically 19 to 21%) sweet dessert wine. 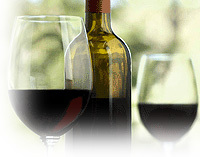 Port style wines are also produced in the New World, typically with varietals common to such regions. Flavors will depend on style produced and, in the New World, what varietals were used. See Style section for more details. Chocolate, blue cheeses, nuts, dried fruits. Cakes with caramel or butterscotch, nuts, dried fruits, mild chocolate.